Ugandan primary school students studying in their classroom .Teaching of Chinese language has become common in many schools across the country. WAKISO – Word after word, with emphasis on intonations, Hilda Ayebare together with her colleagues repeat after their Chinese tutor. The lesson is interactive and when they do not understand something they ask the tutor Qian Mingmin to repeat. This goes on day and night for this pioneer class of language teachers who will be teaching Mandarin in rural schools across the east African country. It is the first batch of the 100 secondary school teachers that China and Uganda agreed to train on how to offer Chinese language classes to Ugandan students. By the end of nine months, the 35 teachers who are now in their second month of studying must have acquired the skills of teaching Mandarin. At break time, Ayebare and her colleague Judith Uwimana sit under a tree shade in the quadrangle of their classroom blocks, reflecting on what they have just learnt. They try out the intonations and meaning of some of the words they have learnt. They are later joined by their colleague Justus Muzuni, who has a background in teaching Swahili, a dialect spoken by people across the East African region. Ayebare and Uwimana are English teachers. The trio told Xinhua in a recent interview that Mandarin is quite different from English or Swahili, noting that there is emphasis on intonation while speaking Mandarin. They said a change in intonation changes the meaning of the word. The three have a positive attitude that by the end of their stay here at Luyanzi College, located in Bweyogerere on the outskirts of the capital Kampala, they will have learnt Mandarin and how to teach it to students. They note that being language teachers, it gives them an edge to learn faster. “It should not be hard, besides our instructors have said they will pay us a visit to asses our progress,” said Ayebare. “I find challenges in understanding the Chinese characters but I know with a positive attitude, I cannot fail to grasp them,” said Uwimana. The break time is over and they dash back to class. This time the lesson is about Chinese grammar. Back in the capital, at Makerere University, the country’s top university, students at the Confucius Institute have just completed a Chinese language proficiency competition to select one person who will soon represent the country at the final Chinese Bridge Competition to be held in China. The Chinese Bridge is an international Chinese culture and language proficiency program where Chinese language and culture students from institutions worldwide compete in various categories. In Uganda, Benedict Bataringaya emerged the winner out of 12 participants. 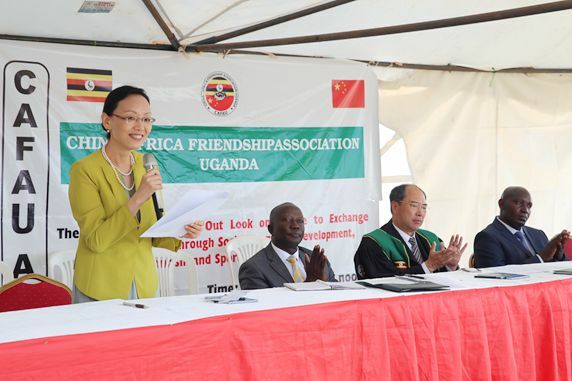 Speaking at the event held on May 26, Ayub Sooma, Chairperson of Uganda-China Friendship Association said the competition cements the people to people relation between China and Uganda. Other speakers noted that Ugandans who learn the language will be able to know the Chinese way of doing business and negotiate better with them in order to tap the opportunities. Figures from the Ugandan government indicate that China remains one of the main sources of Foreign Direct Investment in the country. In the last five years, the figures show that Chinese investment grew to 3 billion dollars with a potential of creating 45,000 jobs. Hong Yonghong, Chinese Director of the Confucius Institute at Makerere University, told Xinhua that they have 80 students studying Mandarin as one of their subjects at bachelor’s degree level and over 2,000 people doing short courses in Chinese across the city. He said there are plans to increase the number of Chinese tutors to cater for the rising demand to learn Chinese.